Welcome to Mako Fishing Charters my name is Tony Pollard, and I'm one of the Skippers on the Panama II. 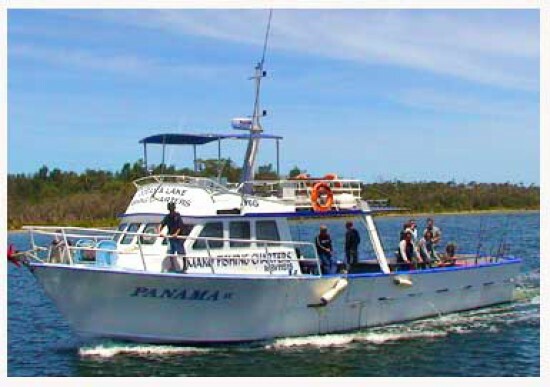 The Panama is a very spacious vessel, capable of hosting large offshore fishing groups, or suitable for individuals to take a leisurely fishing trip around the Gippsland Lakes. Licensed for up to 100km off shore fishing, or staying close to home fishing the 400km2 of Gippsland Lakes and taking in some spectacular scenery along the way. Minimum requirements for passengers are 4 people for Offshore fishing trips and 6 people for Gippsland Lakes fishing trips. Also enquire about our Custom Fishing Charters. We can customise a charter to suit your needs and group.